Fast & Easy Arrangements with 1 or 2 Flowers! 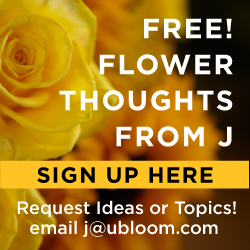 This week on Fun with Flowers and J, I add to my Fast and Easy Flower Series… with projects for 1 or 2 Flowers. I love including flowers in entertaining or for decorating…and using a single flower or two is an easy way to make something Fast and Easy! It’s a great way to include flowers in your life everyday, in every way…Let’s Celebrate a Life in Bloom!